While Extraordinary Miracles Abound, Many No Longer Believe in True Presence of the Holy Sacrament | Fr. Richard Foley S.J. The feast of St. Scholastica, which is ordinarily celebrated today, is superseded by the Sunday liturgy. The first reading is taken from the book of Isaiah (Is 6:1-2a, 3-8). This reading describes Isaiah's call to prophetic office. According to Jewish tradition, Isaiah was of royal stock. It is certain that he belongs to the tribe of Judah and that his home was in Jerusalem. From the time of his calling, Isaiah's whole life was devoted to the "Lord Yahweh". The Lord had called him and henceforth Isaiah was His servant. Jeremiah's call to office was in the form of a dialog between Yahweh and Jeremiah; Isaiah's is a majestic vision. Isaiah is eager to serve God, "Here I am," I said, "send me!" The second reading is taken from the first letter of Paul to the Corinthians (1 Cor 15:1-11). St. Paul treats the subject of the resurrection of the body. A characteristic Greek and Platonic concept was that the body was a hindrance to the soul's activity. St. Paul answers this question by declaring that the bodily resurrection of Christ is a fact duly attested to by chosen witnesses. The Gospel is a reading from St. Luke (Lk 5:1-11). How the wisdom of God differs from the wisdom of men! If a businessman of today (or even of the year 28 A.D.) were choosing a chairman and assistants for the world-wide enterprise he was about to set up, is it likely that he would choose them from among the unknown, unlettered fishermen of Galilee? Yet Christ, who was about to set up not only a world-wide institute but an everlasting one, chose these simple fishermen and made them his assistants and his successors in the work that he had taken in hand. And it wasn't that he was restricted in his choice. There were many highly educated priests and scribes in Jerusalem whom he could have won over, men who could preach and instruct so much more eloquently than Peter or Andrew. There were Roman officers in Palestine who were highly educated, and who would be much more eagerly listened to in the Gentile world. There were Greek philosophers whose very name would add prestige to the Gospel message had they been Apostles. Yet it was to none of these that Christ entrusted the arduous task of spreading the good news of the Gospel, it was to none of these that he gave the keys of his kingdom. While thanking God today for our Christian religion, with its clearly-drawn map of salvation, let us show our appreciation by doing our own little part, as humble apostles, weak but willing helpers of Christ. This we can do without eloquence, or personal prestige. We do so by living as true Christians in our homes, in our places of work, and in our recreations, by carrying our cross daily and patiently, ever ready to give a hand when the neighbor's cross seems too heavy for him. This will be Christian eloquence, this will be a true apostleship of Christ, because actions speak louder than words. 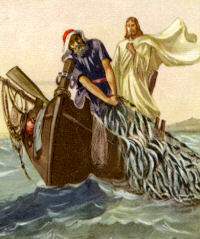 Prepare a fish dinner and discuss what it means to be "Fishers of Men". Ask your children if this just applies to priests or if they can also "fish" for men. Say a prayer for the Holy Father. "'Sir, didst thou not sow good seed in thy field?' He said to them, 'An enemy has done this'" (Gospel). The problem of evil is indeed a mystery. But the problem of good would indeed be a greater mystery, did not the good seed of the word of Christ dwell amongst us unto a harvest of mercy, kindness, humility, meekness, patience (Epistle); did not Jesus offer up today's sacrifice of reparation (Secret) and give us a Sacrament of salvation (PostCommunion). During the week, the enemy will try to sow weeds in the field of our daily life; but in our Mass today, the Divine Sower sows His good seed, that it may grow and ripen until gathered by the Divine Reaper into the heavenly barns.